Unabashed romantics (and yes, I’m one of them) can easily view the Story of The Red Thread in terms of two strangers from opposite sides of the world brought to the same coffee shop for a morning latte. Their eyes meet, a conversation starts and the delightful dance of love begins. But this meant-to-be connection can occur in ways that may not be of a romantic nature. As someone who writes books for animal lovers I’ve spoken to enough “fur people” over the years to know many of us believe meeting our forever critters was written in the stars. I’ve felt that way about all my dogs and cats. 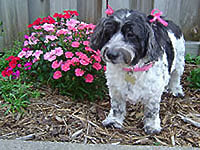 When I lost my dog, Jake, in 2006, I took my sweet boy to a place where he would be cremated. This was difficult for me because it was the first time I was having a companion animal cremated. I brought the people a set of my books for their waiting room. 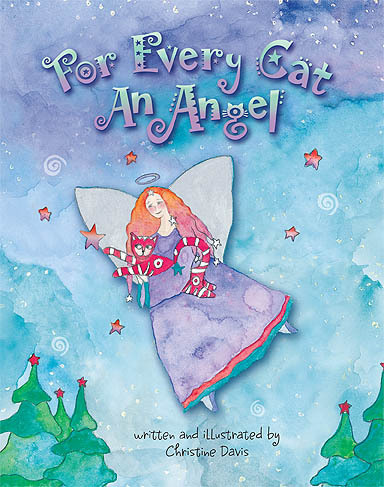 One of them started flipping through my book For Every Cat An Angel and suddenly stopped when she saw a particular illustration. It turned out years earlier I had donated a signed poster of that illustration to the Children’s Cancer Foundation here in Portland. It had been bought by a local veterinarian, who put it up on their office wall. When the woman from the cremation facility went to pick up a critter at the vet she saw the poster and liked it so much the vet gave it to her. It was now hanging in the room next to where I was crying over my dear Jake. I’d created only ONE poster and somehow I’d been reunited with it. In 2012 my world was completely changed by a BBC television show I’d only found by accident. An actor’s performance reached through time and space and literally saved my life. It was as if the script had been written just for me. Each component was crucial. Had any element been missing it might have been an enjoyable episode but it wouldn’t have been life-altering. There’s no question in my mind that one of those mystical red threads connected me to the people on the other side of the planet who brought this TV show to the screen. When I look in the mirror I see all the red threads that have been woven into my life. Some of them have come full circle while others live in the mystery, waiting to be revealed. May 2015 be the year you follow the red thread that is tugging at your heart. I wholeheartedly agree with you on this! If only everyone would be tuned in and observant of these special connections. I look for them everywhere and it truly is amazing! Happy New Year, Chris! I agree, Maria. 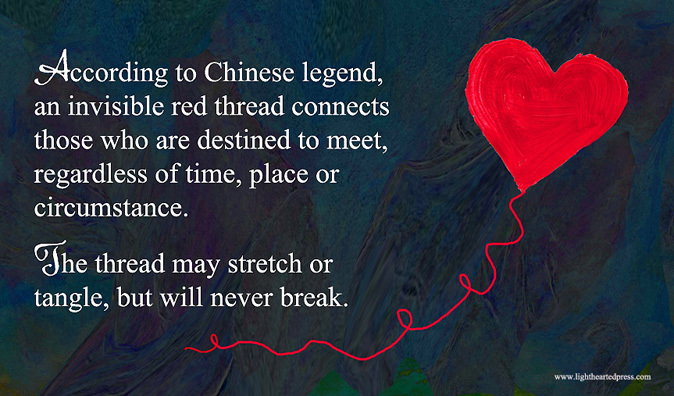 Those red threads ARE amazing, even when they connect us to someone who may have come into our life to help us face something difficult! Chris, this graphic is purrfection and the post is synchronicity in action. The more aware we are of the connections, we more they happen. Wishing the finest red threads in 2015 for you! Thank you, Layla – I’m glad a red thread connected us! It sure did connect us! I just rediscovered this book today which was given to me in 2007 :). And, here I am reading your blog and find it so uncanny that you make mention of Merlin. I also discovered the show by accident on Netflix several years ago. Never has a show impacted me as much as it did and continues to do so. It was a brilliant creation! Debbie, how wonderful that we’re meeting here today! If you feel like sharing, I’d love to hear how Merlin impacted you. Hi Chris! Tiger Lily’s (my forever cat) mom here. Sorry to just now be posting this but the past 7 months have been daunting. I have to share with you how Spirit/God has used you once again to help me through a great loss. My best friend since the first day of Kindergarten died tragically at the end of December. She was in an accident and being kept alive by machines. I went to the hospital on December 28th to say goodbye to her. When I came home and saw your post, I knew it was a sign from her. You see, she adopted a little girl from China in 2010. The Story of The Red Thread was a favorite of hers as she felt it applied to her daughter and self. She had a picture hanging in her house that depicted the Red Thread. What better way to give me a sign than by having my favorite author whose book got me through Tiger Lily’s death post something she believed in and that certainly applies to her death?! Thank you. Yes, no coincidences my friend!